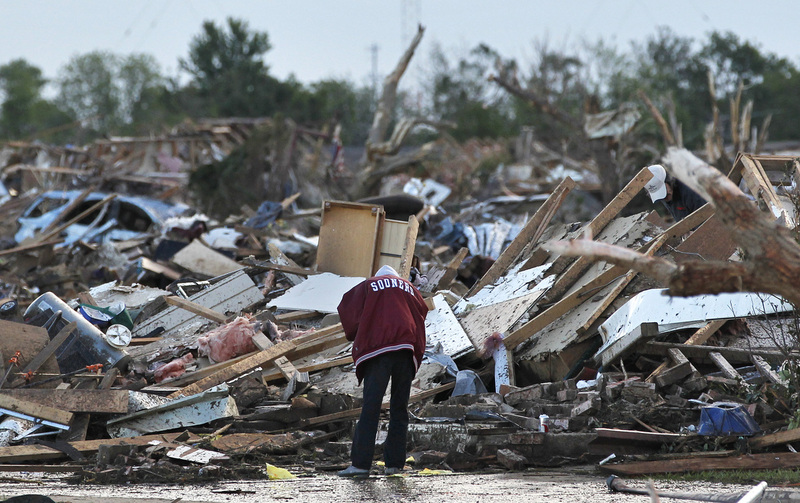 (Photo Courtesy of Brett Deering/Getty Images) Philip Gotcher stands in the rubble of his destroyed house. 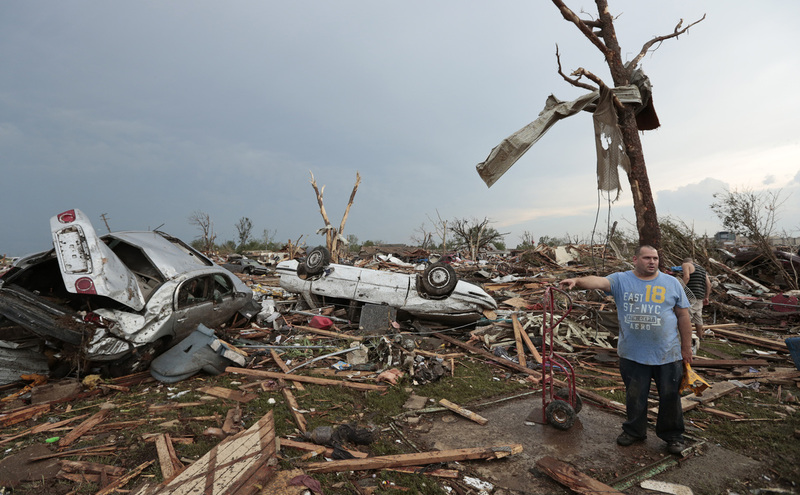 Emergency crews and volunteers continue to search for survivors Tuesday after the devastating tornado that ripped through Moore, Oklahoma on Monday. 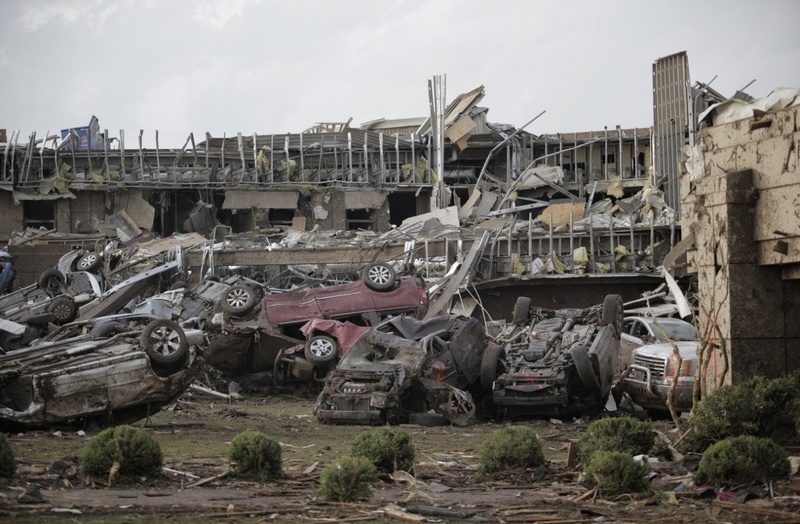 The tornado killed dozens and injured hundreds, destroying and flattening anything in its path, including a hospital and at least two schools. Oklahoma state medical examiner office claims 24 bodies have been recovered from the wreckage so far, nine being children, even though some reports claim over 50 bodies have been recovered. The National Weather Service assigned the twister a preliminary ranking of EF4 on the Enhanced Fujita Scale, meaning the second most powerful category of tornado with winds up to 200 mph. (Photo Courtesy of Brennan Linsley) Local resident looks through the ruble of a home. Plaza Towers Elementary School in Moore was reduced to a pile of twisted metal and toppled walls. Rescue workers were able to pull several children from the rubble, and on Tuesday, as a chilly rain swept through the area, crews were still struggling to cut through fallen beams and clear debris. U.S. Representative Tom Cole, who lives in Moore, said the Plaza Tower school was the most secure and structurally strong building in the area. AgapeLand Learning Center, a day care facility, brought 15 children into two bathrooms, draping them with a protective covering. As the wind ripped the roof off one of the bathrooms, and debris rained down on the children, they remained calm, singing “You Are My Sunshine,” the assistant director, Cathy Wilson, said. Though the day care center was almost entirely destroyed, the children were unharmed. But the storm’s not over yet, southwest Arkansas and northeast Texas, including Dallas, are under the gun for severe weather Tuesday, more tornados are predicted.